We've eliminated those extra metals to give you a cleaner and sleeker frameless shower door. Now, you can see more. Whether you need an in-home consultation or you visit one of our conveniently located showrooms, we will listen to your needs and suggest a solution that is right for you. Upon your request, we will schedule a representative to accurately measure your shower openings to ensure a proper fit. Once the order is placed, we will process your order, secure your hardware and fabricate your glass beyond all industry standards, placing emphasis on quality and function. The final touch is a professionally installed frameless shower enclosure. All work is done by our own fully insured, background checked, employee, not subcontractors. We do it all for you! Frameless shower doors have become the standard for new, upscale homeowners, and MY Shower Door is Florida’s choice for frameless shower door manufacture and installation. Frameless Shower Doors can add value and a sensation of elegance to any bathroom. We create our heavy shower glass in-house, giving your new shower a modern look without the need for that bulky and unattractive aluminum channeling. We’ve eliminated those extra metals to give you a cleaner and sleeker frameless shower door. Add our specially formulated MY EZ Care Shield for easy maintenance and a glass that radiates brilliance. The floor or the threshold is not level and one side is higher than the other. When this is the case the door will either rub on the bottom (if the floor is high on that side) or will leave a large gap beneath (where the floor is low on that side). If you are interested in a frameless sliding shower door do your research to discover the glass thickness and clarity that best achieves your goals on a design and functionality level. You will also want to consider the hardware that supports the glass, the roller wheels, and the door handles. 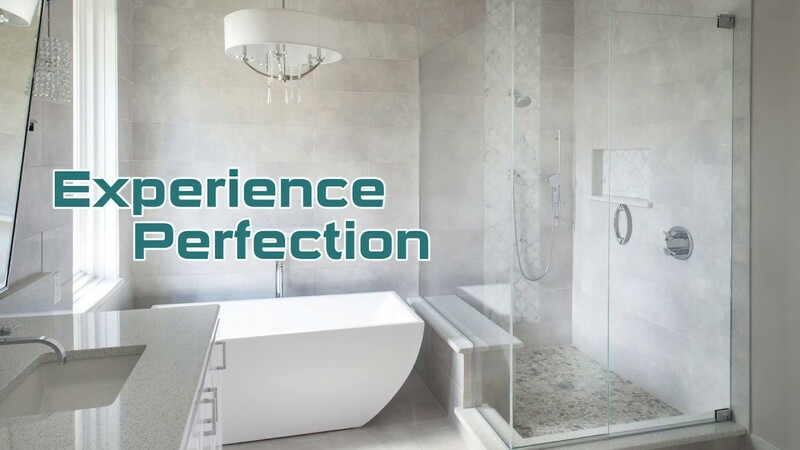 Additional considerations will include finding the right hardware and supports based on your overall choices, which will be discussed with you by our shower experts. If a swinging glass door has caught your attention the proper hinge system is imperative to a successful installation. Hinges need to handle the weight of your frameless shower door as well as daily use by multiple people. A Pivot style hinge can hold more weight and place the burden of stress on the threshold instead of cantilevering it off the wall. Pivot style hinge is able to hold more weight and place the burden of stress on the threshold instead of cantilevering it off the wall. Wall hinges are an old technology and do not guarantee holding the glass in place securely. Even though there are twice as many screws needed to hold a wall mount hinge in place, their reliability is nowhere close to what a pivot style can secure. Our MY PIVOT Shower Door offers the smoothest transmission of weight of any frameless shower door, anywhere. 2. Ultra Clear Glass – low iron glass (which has nearly no green tint). The low iron content is achieved at the glass “float plant” when the sand is poured on the large conveyors and run below a large electromagnet which extracts the volume of iron in the sand. This produces a more translucent glass than the generic clear glass which is given by most ordinary glass shops.